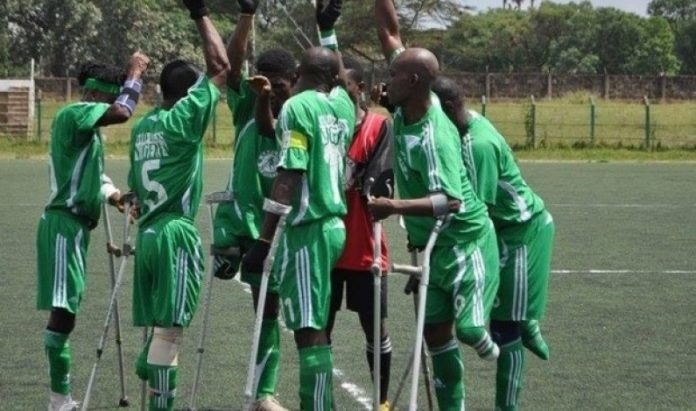 Back from a five-year hiatus forced by their inability to pay their affiliation fees to the World Amputee Football Federation (WAFF), the Nigeria Amputee Footballers have a renewed hope that they will feature at the 2018 World Cup in Mexico. The Nigeria Amputee Football Federation (NAFF) was founded in 2005 to give succor to people who are disabled but are keenly interested in the round leather game — football. At inception, the primary objective of the founders was apparently to ensure that amputees with their disability could be useful to themselves instead of begging on the streets. However, several years down the line, the laudable dream has not been achieved as the monster challenge facing the sport remains lack of adequate funding and neglect. Coach of the Nigeria Amputee Football team dubbed; Special Eagles, Victor Nwewe told Bounce Sports, it has always been a tedious task staying afloat over the years. After the promising starts displayed in African championship, the amputee footballers could not forge ahead into the bigger stage. “In 2013, we went to Kenya, where we lost to the eventual winners in the semi-finals. Since then, we have been trying our best but the challenges are so enormous no sponsorship deals to help to another tournament, the players are no longer motivated. “Many of them have personal challenges and have left to go and face those challenges. Once in a while, we bring them together to try to talk to them and train but we cannot keep them if we have nothing to pay them or a competition in the horizon, so they return to their lives.” He lamented. Failure to meet its financial obligations to the world body meant that Nigeria was suspended since 2013 and only got re-admitted in 2018. With the readmission, Coach Nwewe hopes Nigeria will play at the World Cup in Mexico later this year. It is disheartening that in a country where the Super Eagles are commanding as much as N18bn in sponsorship deals ahead of the World Cup, nobody is sparing a thought for those playing despite their disability.